Controlled Remote Viewing is a method of psychic reporting created by the late ‘father of remote viewing’ Ingo Swann. Whilst in the employ of SRI as a subcontractor circa 1972-86, Ingo disassembled his internal psychic process and used this as a map to build a six stage process that he could then pass onto others (military and intel spooks) in an in-depth two year process of replication and reinforcement. CRV or controlled Remote Viewing was sold as a training method to the U.S military as part of the umbrella group of projects now known as Project STAR GATE. taken inside Fort Meade it was then adapted to their needs and operational training and uses and further expanded, but still keeping the core six stage CRV process. In 1992 Ed Dames or Dr doom or whatever else you’d like to call him, left the military and started to present the remote viewing he was part of and part trained in, as services for hire in the more esoteric fields like UFOlogy and fringe sciences. Backed-up with people on his board from the Military Intel programs ED was one of the first to discuss the military use of remote viewing and the CRV technology in the public domain. Soon after Ed Dames went down the (now) very traveled (and easier) route of selling training services in remote viewing when the very few paid for projects dried-up. This first foray into Remote viewing training was based on Ed’s partial CRV training with Ingo Swann and the acquired CRV manual from the U.S. Military. From this, remote viewing training spread and many new schools/business and formats of remote viewing were created and named (see here for an idea of the spread). Now, we have a fourth or even fifth generation of remote viewers, teachers and schools teaching forms of CRV Controlled Remote. I myself am a long time user of CRV, being taught in London in 1997. I wanted to present CRV as close as possible as I could to its intended form, its original source, which is why i researched and collated these papers and documents together in this one book, presented before the original ideas and thoughts/methods of Ingo Swann fade away with each new generations own additions. CRV works, the FOIA documents released from the CIA show this. Year upon year, time after time Blind, in protocol testing of both the CRV process and the people learning it showed increases in ability and a intuitive effect. As a student of all remote Viewing but mostly of CRV I collated this book to present key documents from the main people behind the development of this method, and to present and share its roots and core documented methodology all in one easy to reach for, book. The book includes a previously secret Ingo Swann authored document on CRV from the CIA archives, The first documented CRV notes/training materials from one of the programs best remote viewers, and Ingo’s No1. student Tom McNear. This is followed by 2013 comments and notes from Tom, gathered from all the years of experience since he fist wrote his document (1986). We also have the ‘official’ CRV – Controlled Remote Viewing manual, released by PJ Gaenir in 1997, originally written by Paul H Smith and others in the military unit as a comprehensive set of training notes and materials, based on their teaching from Ingo Swann. Surrounding these documents are the comments and thoughts of Pj on why she released the manual into the public domain and also some comments from Paul H Smith at this time. 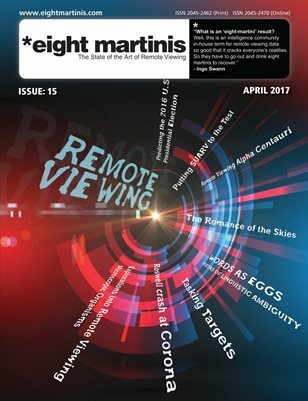 This book is a companion tool for anyone wanting to know more about CRV (Controlled Remote Viewing) its history and as a guide to have as close to as possible a record of the original six stage intuitive process as created by Ingo Swann for SRI and their client the U.S Military circa 1980-1985.